As I mentioned in my previous blog, the time finally came for me to start a new portfolio. I felt I should jump back to some of the “basics”. So I decided to go through Painting 101; get the feel of the brushes, the paints and the canvas. Keep in mind, this “class” took place in my home…. for free… by myself. Youtube can be a great site for learning new painting techniques by the way. For a warm up piece I envisioned an organic painting with neutral tones. 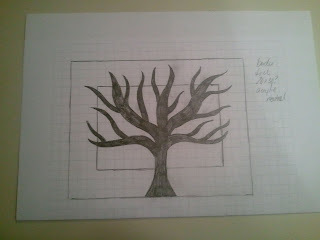 Below is my initial sketch for the idea. I was leaning towards a flat graphic style rather than realistic. From the start, I had some concerns about the piece. Something emphasized over and over in college was to push yourself beyond your boundaries… your comfort zone… create something unique. For me, this was a little Pottery Barn-ish but I still liked the idea. And again, this was just to get my creative vision going. I finished my first draft and wasn’t all that happy. My tree looked a little too flat against the texture of the border. I dove right into creating some texture on the tree. Below is the 2nd draft. A little tweak here and there and I’d be done. 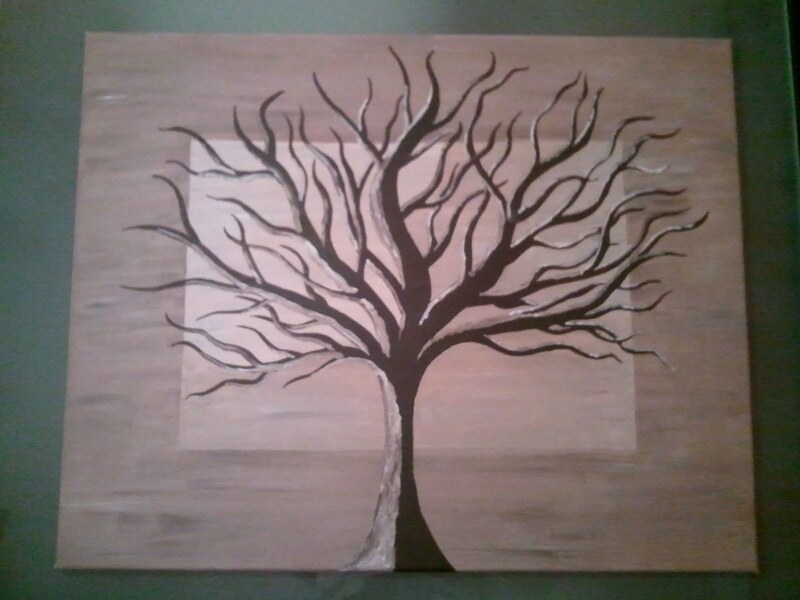 It still wasn’t quite right so I went back adding even more texture to the tree and I changed some of the border. This is what’s great about canvas… just keep adding to it. Or if you totally hate the piece, start completely over! Paint the canvas with gesso and you’re ready to start a new vision. I finally finished my 3rd draft and started to feel better about it. One more round and it would be complete, right? I let the painting sit for a few days. Sometimes walking away from your piece will give you time to think about it and you’ll feel like you’re getting a fresh view when you come back to it. But something STILL wasn’t quite right. Sure, the few who saw it said it looked great but there was something bothering me. I threw it up on a wall and took a quick picture wanting to post the work on Facebook and have my friends and family critic. Was I barking up the wrong tree (no pun intended) or was I headed in the right direction for an awesome art piece? Well, if you’ve read my bio you know Bob Ross is my hero! I always take a deep breath when I make a mistake or my piece is not working out quite right and think to myself, if Bob Ross were here he would say there are no mistakes, only happy accidents. Taking this pic was my happy accident. There wasn’t necessarily a mistake made but in my rush to take the picture my painting suddenly had some added lighting. The yellow in the top corner was not the paint, it was from the light in my hallway…. But I loved the effect. And as some of my friends pointed out, it looked intentional because the highlights on the branches reflected the light perfectly. So after some feedback, I decided to go back at it. I created some balance by making the trunk bigger; added in the lighting effect; and added in one last leaf falling from the tree. My sister had this great idea and mentioned it would add to the solitude theme. This would be my last revision…. Or so I thought. Here I am with my “finished” piece… for now. The leaf needs to be larger considering you can barely see it in this photo. I think the tree could use some more texture through the larger branches. I could go on and on about tweaks I should or could make. Now go full circle back to beginning of this blog and reread the quote... Maybe one day I’ll go back and make a few adjustments, which will no doubt cause me to make further changes. And that’s the beauty of art. It never has to end. For now it’s just stopping in an interesting place. Thanks for stopping by DIY Vintage Chic! I appreciate your time and comments. If you have any direct comments please let me know. Feel free to comment, use my contact page or Facebook. See ya soon! Don't forget to stop by and Like my Facebook Page and Follow me on Twitter !